It has a leathery white-spotted black carapace with white topped ridges. 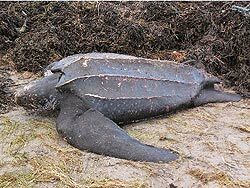 It lacks a bony shell, instead its carapace is covered by skin and oily flesh.The leatherback is thought to be the deepest diving turtle, having been recorded at 1000m. Breeding in Australia occurs mostly during December and January. Size & Weight: Adults grow from 130 - 183 cm in length and weigh 300 - 500 kg on average. Diet: Leatherbacks have delicate, scissor-like jaws. Their jaws would be damaged by anything other than a diet of soft-bodied animals, so they feed almost exclusively on jellyfish and, to a lesser extent, on other soft-bodied invertebrates such as such as tunicates and cephalopods..
Habitat & Distribution: Primarily found in the open ocean, as far north as Alaska and as far south as the southern tip of Africa, though recent satellite tracking research indicates that leatherbacks feed in areas just offshore. Known to be active in water below 5oC, the only reptile known to remain active at such a low temperature. In Australia, leatherback turtles occur in tropical and temperate waters of Australia. Large numbers of leatherback turtles feed off the south Queensland and New South Wales coasts and off Western Australia's coast, south of Geraldton. Most widely distributed of all sea turtles. Found world wide with the largest north and south range of all the sea turtle species. 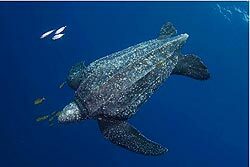 With its streamlined body shape and the powerful front flippers, a leatherback can swim thousands of miles over open ocean and against fast currents. Ocean Conservancy's SEE Turtles project partners with Grupo Tortuguero, Pro Peninsula, and Baja Expeditions to personally connect travelers with wildlife and local conservation efforts for an inspiring, natural adventure. Your first hand participation in this trip will directly support community-based conservation of endangered sea turtles while at the same time provide an alternative income to fishing and help to train local community members in ecotourism.